Copyright by: The Macaulay Library at the Cornell Lab of Ornithology, Ithaca, NY, all rights reserved. Medium-sized songbird. Plumage is characterized by white outer tail-feathers that flash when the bird takes flight and by a gray or blackish "hood" (head, nape, throat) and dark back that contrast with its whitish breast and belly. Exhibits marked geographic variation in plumage coloration and moderate variation in size with intergradations between the five distinctive groups. Identification of most groups is well covered by Howell and Webb (1995), Rising (1996), Dickinson (1999), and Sibley (2014) (Nolan et al. 2002). For a comprehensive review of the conservation status, habitat use, and ecology of this and other Montana bird species, please see Marks et al. 2016, Birds of Montana. 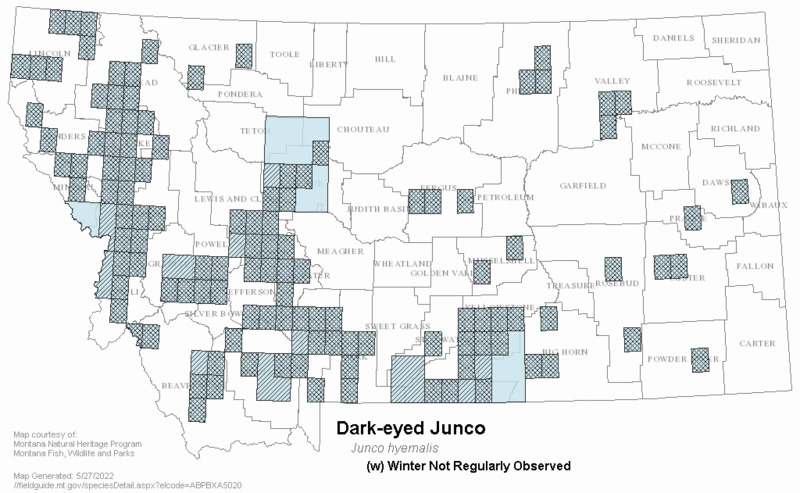 The Bozeman migration for the Dark-eyed Junco (Oregon) is from March 25 to May 10 and September 6 to November 5. For the Dark-eyed Junco (Slate-colored), migration dates are from April 2 to May and October 3 to November 15. Occurs across the continent from northern Alaska south to northern Mexico. Conspicuous ground-foraging flocks are often found in suburbs (especially at feeders), at edges of parks and similar landscaped areas, around farms, and along rural roadsides and stream edges (Nolan et al. 2002). Seeds and arthropods; occasionally fruit and waste grain in agricultural fields. Most food obtained from ground and leaf litter (Nolan et al. 2002). Territory sizes for the Oregon form of 1.7 to 2.6 acres in Douglas-fir and lodgepole pine in western Montana have been recorded. Nest site highly variable. Most often in small cavity on sloping bank or rock face, under protruding rock, among roots (especially on vertical surface of root ball of large trees topple by wind), and in sloping road cut (especially if overhung by grass or other vegetation). Eggs are elliptical, white, gray, pale bluish white, or pale-greenish white in color. Clutch size most often 4 eggs, 5 and 3 not uncommon (Nolan et al. 2002). Near Fortine, egg dates range from May 1 to August 3. Statewide, nesting is from mid-April to August. Dickinson, M.B. 1999. Field guide to the birds of North America. 3rd ed. Natl. Geogr. Soc. Washington, D.C.
Marks, J.S., P. Hendricks, and D. Casey. 2016. Birds of Montana. Arrington, VA. Buteo Books. 659 pages. Nolan, V., Jr., E. D. Ketterson, D. A. Cristol, C. M. Rogers, E. D. Clotfelter, R. C. Titus, S. J. Schoech, and E. Snajdr. 2002. Dark-eyed Junco (Junco hyemalis). In The birds of North America, No. 716 (A. Poole and F. Gill, Eds.). Academy of Natural Sciences of Philadelphia and American Ornithologists’ Union. Rising, J.D. 1996. A guide to the identification and natural history of the sparrows of the United States and Canada. Academic Press, Inc., San Diego, CA. 365 pp. Sibley, D. 2014. The Sibley guide to birds. Alfred A. Knopf, New York, NY. 598 pp. American Ornithologists’ Union [AOU]. 1998. Check-list of North American birds, 7th edition. American Ornithologists’ Union, Washington, D.C. 829 p.
Anaconda Minerals Company, and Camp, Dresser & McKee. 1981. Anaconda Stillwater Project 6-month environmental baseline report. CDM Project No. 3139. Vol. I Appendix. Jan. 15, 1981. Aney, W. C. 1984. The effects of patch size on bird communities of remnant old-growth pine stands in western Montana. M.S. thesis, University of Montana, Missoula. 98 p.
Baldwin, P.H. 1968. Predator-prey relationships of birds and spruce beetles. Proc. North Central Branch-E.S.A. vol. 23(2). Beak Consultants, Inc. 1983. Wildlife. January 1983. In Stillwater Project Environmental Studies. Addendum A, Wildlife. Vol. I. Tech. Report No. 7. 1982. Bird Conservancy of the Rockies. 2017. Pocket Guide to Northern Prairie Birds. Brighton, CO: Bird Conservancy of the Rockies. 98 p.
Bock, C.E. and J.H. Bock. 1983. Responses of birds and deer mice to prescribed burning in ponderosa pine. J. Wildl. Manage. 47: 836-840. Butts, T.W., Western Technology and R.L. Eng. 1993. Continental Lime Indian Creek Mine, Townsend, MT. Life of Mine Wildlife Reconnaissance. In Life-of-Mine Amendment. Continental Lime, Inc., Indian Creek Mine & Plant. Vol. 2. October 13, 1992. Casey, D. 2005. Rocky Mountain Front avian inventory. Final report. Prepared for the U.S. Fish and Wildlife Service and The Nature Conservancy by the American Bird Conservancy, Kalispell, Montana. Dickson, D.C. 1991. Systematic wildlife observations on the Blackfoot-Clearwater Wildlife Management Area. Montana Department of Fish, Wildlife and Parks. Missoula, MT. 14 pp. plus appendices and photographs. Diem, K. L. and S. I. Zeveloff. 1980. Ponderosa pine bird communities. In: R. M. DeGraff and N. G. Tilghman, eds. Workshop Proceedings: Management of western forests and grasslands for nongame birds. USDA. Forest Service General Technical Report INT-86. p. 170-197. Dobkin, D. S. 1992. Neotropical migrant landbirds in the Northern Rockies and Great Plains. U.S.D.A. For. Serv. N. Region Publ. R1-93-34. Missoula, Mont. Dobkin, D.S. 1994. Conservation and management of neotropical migrant landbirds in the Northern Rockies and Great Plains. Univ. Idaho Press, Moscow, Idaho. 220 pp. Ecological Consulting Service, Helena, MT., 1975, Peabody Coal Company Big Sky Mine: Wildlife environmental indicators monitoring survey. Progress report. Project 58-23-A. June 16, 1975. Ehrlich, P., D. Dobkin, and D. Wheye. 1988. The birder’s handbook: a field guide to the natural history of North American birds. Simon and Schuster Inc. New York. 785 pp. Farmer, Pat, and Dean Culwell, Westech, Inc. [Western Technology and Engineering], Helena, MT., 1981, Terrestrial wildlife reconnaissance. March 1981. Farmer, Patrick J., and Thomas W. Butts, Western Technology & Eng., Inc., Helena, MT., 1994, McDonald Project Terrestrial Wildlife Study, November 1989 - November 1993. April 1994. In McDonald Gold Project: Wildlife & Fisheries. [#18]. Seven-up Pete Joint Venture, Lincoln, MT. Unpub. No date. Flack, J.A.D. 1976. Bird populations of aspen forests in western North America. Ornith. Monogr. 19. 97pp. Gniadek, S. 1983. Southwest Glendive Wildlife Baseline Inventory. Miles City, Mont: Bureau of Land Management, Miles City District Office. 56 pp with appendices. Goodell, J. 2012. Morse Land Company Breeding Bird Inventory And Analysis. High Desert Museum. Bend, OR. 42 pp + Appendices. Hejl, S.J., R.L. Hutto, C.R. Preston, and D.M. Finch. 1995. Effects of silvicultural treatments in the Rocky Mountains. In: T. E. Martin and D. M. Finch, eds. Ecology and Management of Neotropical Migratory Birds. Oxford Univ. Press, New York. pp.220-244. Hutto, R. L., and J. S. Young. 1999. Habitat relationships of landbirds in the Northern Region, USDA Forest Service. U.S. Forest Service General Technical Report RMRS-GTR-32, Ogden, Utah. Hutto, Richard L. 1995. "Composition of Bird Communities Following Stand-Replacement Fires in Northern Rocky Mountain (U.S.A.) Conifer Forests". Conservation Biology. 9 (5): 1041-1058. Johnsgard, P.A. 1979. Birds of the Great Plains: breeding species and their distribution. University of Nebraska Press, Lincoln. 539 pp. Johnsgard, P.A. 1992. Birds of the Rocky Mountains with particular reference to national parks in the northern Rocky Mountain region. Lincoln: University of Nebraska Press. xi + 504 pp. Lenard, S., J. Carlson, J. Ellis, C. Jones, and C. Tilly. 2003. 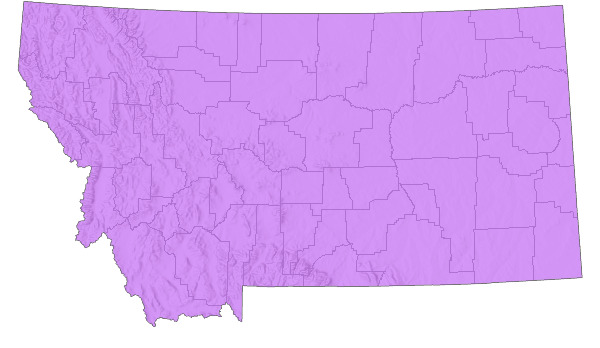 P. D. Skaar’s Montana bird distribution, 6th edition. Montana Audubon, Helena, MT. 144 pp. Martin, Steve A., ECON, Inc., Helena, MT., 1982, Flathead Project Wildlife Report, 1981-1982. November 30, 1982. Matthews, W.L. 1980a. Wibaux-Beach comparison study: Sydney, Glendive and Plevna Study Areas. Bureau of Land Management, Miles City, MT. 50 p.
Montana Bird Distribution Committee. 2012. P.D. Skaar's Montana bird distribution. 7th Edition. Montana Audubon, Helena, Montana. 208 pp. + foldout map. Munts, M.A. 1994. A comparison of bird communities between an untreated control and two timber harvest treatments in western Montana. M.S. Thesis, Univ. Montana, Missoula. 49 pp. OEA Research, Helena, MT., 1982, Beal Mine Wildlife Report. June 17, 1982. Saab, V.A. and T.D. Rich. 1997. Large-scale conservation assessment for neotropical migratory land birds in the interior Columbia River Basin. T. M. Quigley, ed. USDA F.S., Pacific NW Research Station. Portland, OR. Gen. Tech. Rep. PNW-GTR-399. 56 pp. Skaar, P. D., D. L. Flath, and L. S. Thompson. 1985. 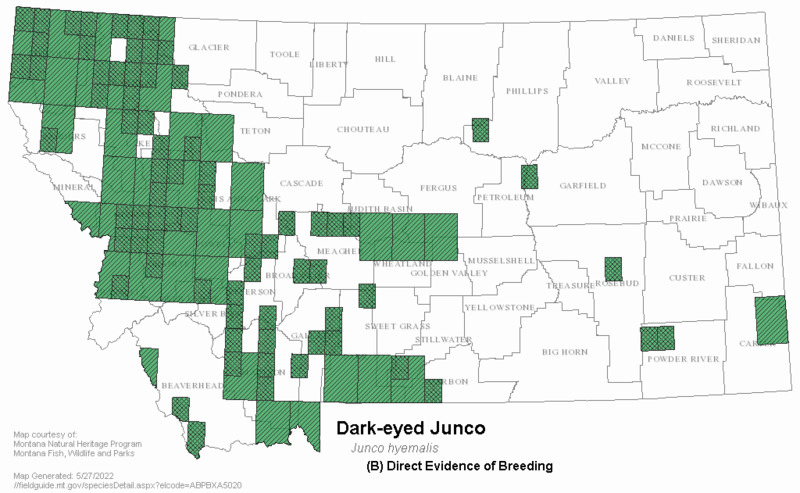 Montana bird distribution. Montana Academy of Sciences Monograph 3(44): ii-69. Skaar, P.D. 1969. Birds of the Bozeman latilong: a compilation of data concerning the birds which occur between 45 and 46 N. latitude and 111 and 112 W. longitude, with current lists for Idaho, Montana, Wyoming, impinging Montana counties and Yellowstone National Park. Bozeman, MT. 132 p.
The Anaconda Co., 1976, Wildlife survey: The Anaconda Company Berkeley Complex 1976 Proposed Permit Area. May 6, 1976. Thompson, Richard W., Western Resource Dev. Corp., Boulder, CO., 1996, Wildlife baseline report for the Montana [Montanore] Project, Lincoln and Sanders counties, Montana. In Application for a Hard Rock Operating Permit and Proposed Plan of Operation, Montanore Project, Lincoln and Sanders Counties, Montana. Vol. 5. Stroiazzo, John. Noranda Minerals Corp., Libby, MT. Revised September 1996. Thunderbird Wildlife Consulting, Inc., Gillette, WY., 2003, Spring Creek Mine 2002 Wildlife Monitoring. March 2003. Tobalske, B. W., R. C. Shearer, and R. L. Hutto. 1991. 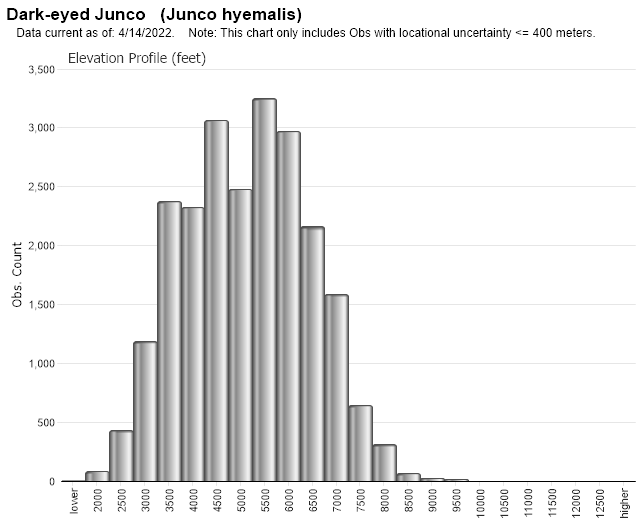 Bird populations in logged and unlogged western larch/Douglas-fir forest in northwestern Montana. U.S. Forest Service Research Paper INT-442, Ogden, Utah. 12 pp. U.S. Forest Service. 1991. Forest and rangeland birds of the United States: Natural history and habitat use. U.S. Department of Agriculture, Forest Service Agricultural Handbook 688. 625 pages. Westech, Inc. [Western Technology and Engineering]. 1989. Reconnaissance of terrestrial wildlife resources in the Pauper's Dream project vicinity, Aug. 1988. Prepared for Hydrometrics, Inc., Helena, MT. 22 pp. Western Technology and Engineering, Inc. (WESTECH)., 1989, Wildlife Monitoring: Absaloka Mine Area Annual Report, 1989. 12/21/88-12/20/89. Montana SMP 85005 R1. OSMP Montana 0007B. Febr. 15, 1990. Western Technology and Engineering, Inc., Helena, MT., 1989, Reconnaissance of terrestrial wildlife resources in the Basin Creek Mine Amendment 5 vicinity, 1988-1989. November 1989. In Basin Creek Mine Permit Amendment No. 5 - Paupers Pit Southwest, Block B and leach Pad No. 3. Basin Creek Mining, Inc. (Pegasus Gold Corp.). For Montana Dept. of State Lands and USFS Deer Lodge NF. Western Technology and Engineering, Inc., Helena, MT., 1989, Reconnaissance of the wildlife resources in the vicinity of the Kendall Venture Mine. January 1989. In Kendall Venture North Moccasin Project: Amendment to Operating Permit 00122, Fergus County, Montana. Vol. 2, App. A, Feb., 1989. Westmoreland Resources, Inc., Hardin, MT., 1981, Upper Sarpy Basin Wildlife Study. In 1981 Wildlife Report. April 1982. 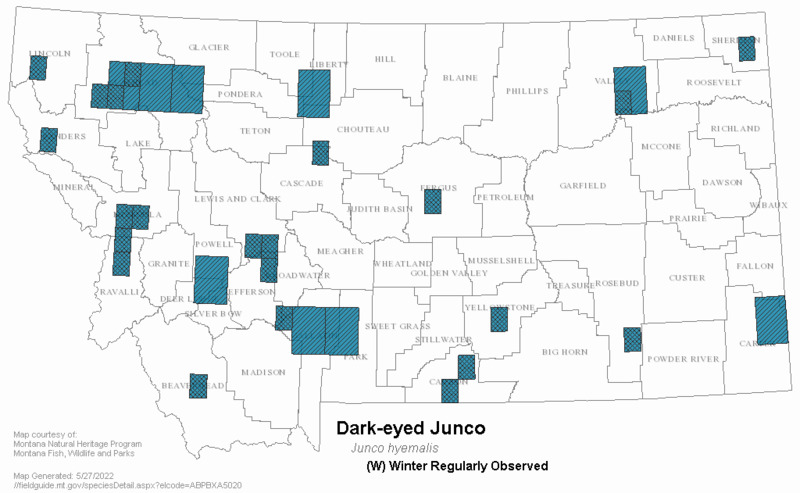 Web Search Engines for Articles on "Dark-eyed Junco"
Additional Sources of Information Related to "Birds"